If you have a passion for learning new things and don’t mind experimenting, try designing your blog yourself. Of course, your reasoning could be less adventurous — say, you might just not have the funds right now to pay someone else to design your blog. Regardless the reason, designing your own blog can be rewarding! When you get stuck, research your way to the answer. You’re definitely not the only one who’s ever designed their own blog. The Internet is full of tutorials, forums, and videos that can teach you how to do something. You could teach yourself many, many things about design. Bloggers who design their own blogs themselves typically work on blog frameworks like Genesis or add customization to predesigned templates that offer a lot of flexibility. Lower cost: Creating your own blog design is budget friendly. You might spend some money on imagery, a special plug-in, or a theme to serve as the shell of your design, but those outlays are far less than what you’d pay to hire someone. New skills: Design programs, HTML, and CSS may be unfamiliar to you when you start, but as you work through your design, you learn new skills that allow you to make your own changes to your blog whenever you want. 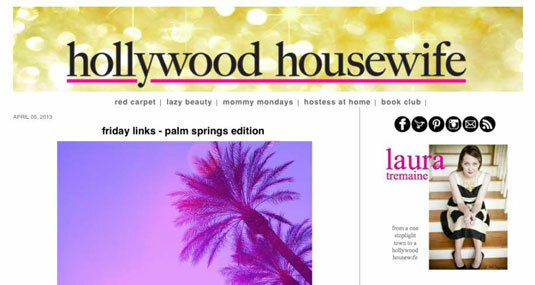 Blogger Laura Tremaine rolled up her sleeves to design her own blog, Hollywood Housewife. Fits your style: No one has a better sense of your tastes than you! You don’t have to worry about finding the perfect premade theme or working with a designer who can’t quite nail the look and feel you’re after. Takes time to learn: Heading into unknown territory can be exciting, but you’ll undoubtedly spend many, many hours designing your own blog. Something that takes a professional designer two minutes to complete may take you longer if you have to learn how to do it. Lack of technical assistance: Certain coding mistakes can cause other areas of your sites to not work — or worse, can crash your blog. In addition, small tweaks to your site can be time consuming. May not get exactly what you want: You may have a cool idea for your design but not know how to create it. While searching online for a tutorial can often work, you may find certain ideas just go beyond your current abilities. If you design your own blog but get stuck with something, you can always hire someone just to create a single design element.